Blue Origin's New Shepard capsule separates from its rocket during a successful "in-flight escape test" on Oct. 5, 2016. Blue Origin hopes people use the company to get two different sets of astronaut wings. Blue Origin, which is run by billionaire Amazon.com founder Jeff Bezos, is developing a reusable rocket-and-capsule combo called New Shepard to take people (and experiments) on brief trips to suborbital space. And last month Bezos unveiled New Glenn, a huge orbital vehicle that the company aims to start flying by 2019 or so. "We're going to make sure that our astronauts that fly on New Shepard are going to get first access to tickets on New Glenn," Ariane Cornell, who's on Blue Origin's Strategy and Business Development team, said Wednesday (Oct. 5) during the live webcast of New Shepard's in-flight escape test. That uncrewed test showed how the New Shepard capsule would keep astronauts safe during a real-life launch emergency. 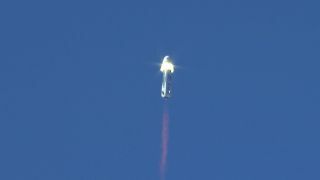 About 45 seconds after lifting off from Blue Origin's west Texas test site on Wednesday morning, the capsule briefly fired its onboard escape motor, blasting itself well clear of the booster. Blue Origin may begin crewed test flights of the New Shepard system next year, with commercial operations possibly beginning as early as 2018, Bezos has said. New Shepard will take passengers 62 miles (100 kilometers) above Earth's surface — the traditionally recognized boundary line where outer space begins. Customers will experience about 4 minutes of weightlessness during the 11-minute flight and see the curvature of the Earth against the blackness of space, Cornell said during today's webcast. Blue Origin's New Glenn orbital rocket will come in two versions to fly people in space and will be a towering booster. This Blue Origin graphic shows how the 270 feet (82 meters) and 313 feet (95 m) tall versions of New Glenn measure up to other rockets. Blue Origin has not yet revealed how much a New Shepard ticket will cost. The company's chief suborbital-spaceflight competitors, Virgin Galactic and XCOR Aerospace, are currently charging $250,000 and $150,000 per seat, respectively, if that's any guide. A ticket to orbit aboard New Glenn will be quite a bit pricier than any suborbital jaunt, so it's safe to say that anyone who rides both New Shepard and New Glenn in the near future will be a very well-to-do individual. But that may not always be true; Bezos aims to slash the cost of spaceflight via the development of reusable rockets and spaceships, and his stated vision for Blue Origin is to help create a future in which millions of people are living and working in space.